It is a strong indicator of today’s globalized world and rapidly growing access to Internet platforms, that we have users from over 188 countries and 500 cities globally using our Text Analysis and News APIs. Our users need to be able to understand and analyze what’s being said out there, about them, their products, services, or their competitors, regardless of the locality and the language used. 70% of active Instagram users are based outside the US. A look at online review platforms such as Yelp and TripAdvisor, as well as various news outlets and blogs, reveals similar patterns regarding the variety of language used. Therefore, no matter if you are a social media analyst, or a hotel owner trying to gauge customer satisfaction, or a hedge fund analyst trying to analyze a foreign market, you need to be able to understand textual content in a multitude of languages. Scaling Natural Language Processing (NLP) and Natural Language Understanding (NLU) applications – which form the basis of our Text Analysis and News APIs – to multiple human languages has traditionally proven to be difficult, mainly due to the language-dependent nature of preprocessing and feature engineering techniques employed in traditional approaches. 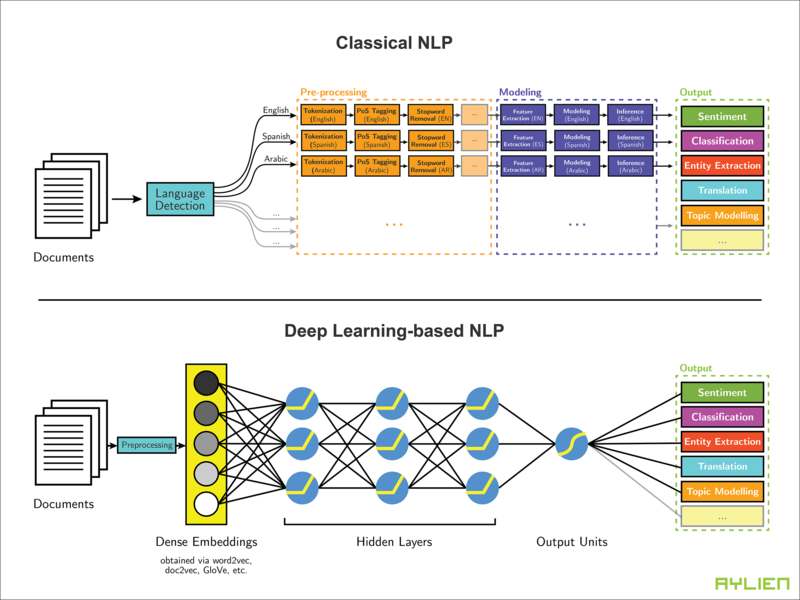 However, Deep Learning-based NLP methods, which have gained a tremendous amount of growing attention and popularity over the last couple of years, have proven to bring a great amount of invariance to NLP processes and pipelines, including towards the language used in a document or utterance. At AYLIEN we have been following the rise and the evolution of Deep Learning-based NLP closely, and our research team have been leveraging Deep Learning to tackle a multitude of interesting and novel problems in Representation Learning, Sentiment Analysis, Named Entity Recognition, Entity Linking and Generative Document Models, with multiple publications to date. Additionally, using technologies such as TensorFlow, Docker and Kubernetes, as well as software engineering best practices, our engineering team ensures this research is surfaced in our products by ensuring our proprietary models are performant and scalable, enabling us to serve millions of requests every day. Today we’re excited to announce an early result of these efforts with the launch of the first version of our Deep Learning-based Sentiment Analysis models for short sentences which are now available for English, Spanish and German. 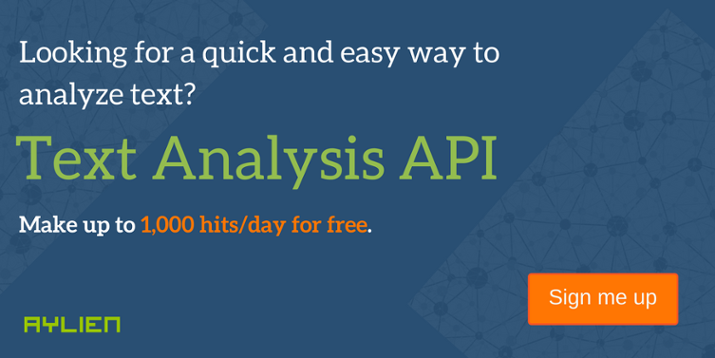 Try it out for yourself on our demo, or grab a free API key and an SDK to leverage these new models in your application. Our new models leverage the power of word embeddings, transfer learning and Convolutional Neural Networks to provide a simple, yet powerful end-to-end Sentiment Analysis pipeline which is largely language agnostic. Additionally, in contrast to more traditional machine learning models, this new model allows us to learn representations from large amounts of unlabeled data. This is particularly valuable for languages such as German where manually annotated data is scarce or expensive to generate, as it enables us to train sentiment models that leverage small amounts of annotated data in a language to great effect. Source: Training Deep Convolutional Neural Network for Twitter Sentiment Classification by Severyn et al. Over the next couple of months, we will be continuing to work on improving these models as well as rolling out support for even more languages. Your feedback can be extremely helpful in shaping our roadmap, so if you have any thoughts, ideas or questions please feel free to reach out to us at hello@aylien.com. We are also excited about the new research that we’ve been doing on cross-lingual embeddings, which should make the process of multilingual Sentiment Analysis even easier. Parsa is an AI, Machine Learning and NLP enthusiast, whose aim is to make these techniques and technologies more accessible and easier to use for developers and data scientists. When he’s not working he likes to play chess ('parsabg' on lichess.org).